All of us need to love. We need something beautiful, true and good, and we are looking for the beautiful, the true, and the good. We feel that these things don’t exist in us, that what is really beautiful, what is really true, and what is really good, is not in us. Therefore we look for it, and sometimes we feel that we have found the object of our love. The person before us is a symbol of what is beautiful, of what is true, and we fall in love with that person. We have found the object of our love. There are two things to be looked at. The first is the impression that this beauty, this truth, this goodness, is not in us. The second thing is that we feel that what we are looking for must be outside us, and therefore we feel that this person is the object of our love, and we feel satisfied and happy. That is the foundation of our love, but after a time we discover reality is not what we thought. The other person, the object of our love, shows herself or himself to be different from what we thought in the first place. We are disappointed, and we keep looking for the beautiful, the good, and the true. ... The same thing happens in the spiritual realm. We are thirsty for truth, we are thirsty for goodness, for compassion, we are thirsty for spiritual beauty, and we are looking for these things. We meet someone, a spiritual teacher, a spiritual friend, and we feel so happy. To be able to sit there and look at the teacher, look at the spiritual friend, brings us a great deal of happiness, but this does not last very long, because the discovery may be a false discovery. We may have a wrong perception of this person who represents truth, goodness and beauty, just as in the realm of falling in love. When he woke up at the foot of the Bodhi Tree, the Buddha Shakyamuni said, "How strange - all beings possess in themselves the capacity to understand, the capacity to love, the capacity to be free. Everyone has that capacity, but everyone allows himself or herself to be carried away on the ocean of suffering. How strange!" This is what the Buddha declared at the moment of his enlightenment under the Bodhi tree. He noticed that what we are looking for, day and night, is already there within oneself. What is beautiful, what is true, what is good, is already there in oneself. We can call it the Buddha-nature, the Buddhahood, the awakened nature, the true freedom, which is the foundation for all peace and happiness. This wonderful thing is in us, and a real teacher is someone who can help you to touch that thing in yourself, who helps give birth, to bring about the real teacher which already exists in yourself. Truly Inspiring Thich Nhat Hanh is a Vietnamese Buddhist (born 1926) monk as well as a writer, scholar, and teacher. He was ordained as a Zen Buddhist monk in 1942 at the age of 16. In 1961 he travelled to the United States where he studied at Princeton and later lectured on comparative religion at Columbia. In 1964, Thich Nhat Hanh returned to Vietnam and with other Buddhist students, helped found Van Hanh University. Through the University and the La Boi Press publishing house they also set up, they released a steady stream of publications and writings calling for peace and reconciliation. 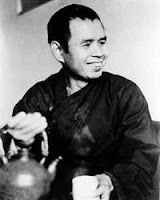 Nhat Hanh also founded the School of Youth for Social Service, which performed various services such as rebuilding villages destroyed by bombings. By the mid-70s, more than 10,000 monks, nuns, and students were involved with the organization. They are perhaps best known for their role in evacuating villagers caught in the cross fire: monks and nuns, dressed in their yellow robes, would enter the battlefields, form a double line and walk the villagers to safety. Thich Nhat Hanh's writings and publications were censored by both opposing Vietnamese governments. In 1966, after travelling to the United States to lecture about the plight of the Vietnamese people, he was warned not to return to Vietnam. He has been living in exile since then. He was nominated for a Nobel Peace Prize by Martin Luther King, Jr. in 1967, and led the Vietnamese Buddhist Peace Delegation to the Paris Peace Talks in 1969.